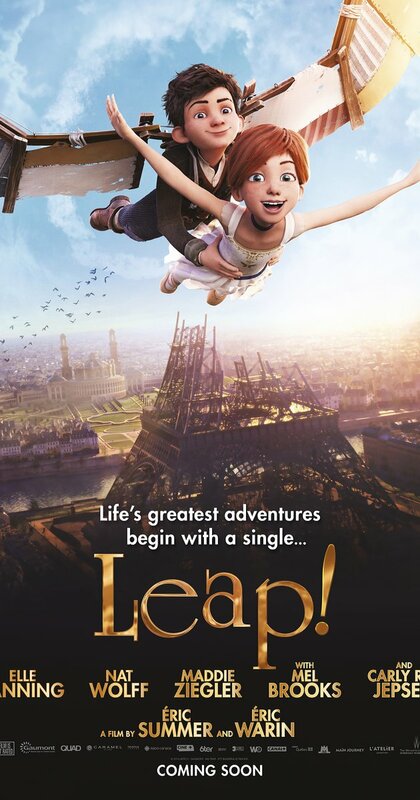 In 1880’s France, the Eiffel Tower is still being built, and two young orphans dream of escaping their rural orphanage to pursue their dreams in France. Free-spirited and adventurous Félicie dreams of being a ballerina while her clever but awkward friend Victor dreams of being an inventor. One night, they escape their castle-like orphanage, and manage to outrun M. Luteau, the orphanage supervisor who chases them on his motorcycle. Félicie and Victor stow away in an overnight train and awake to find themselves in Paris. It’s the city of their dreams, but they’re alone and without resources. 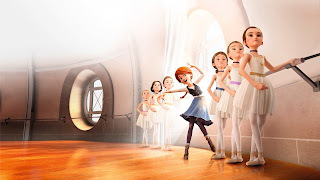 They get separated, but Félicie is excited to see the famous ballet school where she hopes to train. Félicie goes to the school in the evening. An employee misinterprets her to be a thief and prepares to strike her, but Odette, the caretaker of the building. Félicie follows Odette to Odette’s other job and offers to help her clean. Félicie wants nothing more than to be a ballerina. She is impressed to meet Camille, the daughter of the cruel wealthy woman whose mansion Odette cleans. 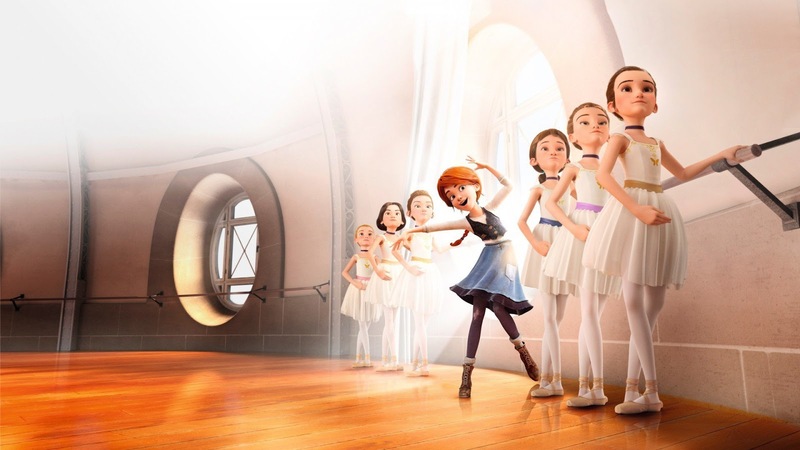 Camille is cruel to her, and in retaliation, Félicie steals an invitation intended to admit Camille to a series of auditions at the ballet school. Félicie attends, pretending to be Camille, but her deception is uncovered, and she must compete with Camille for the chance to live her dreams. Félicie and Victor are orphans. The orphanage staff – a nun named Mother Superior and a supervisor named M. Luteau – are stern, but they appear to care for the children. 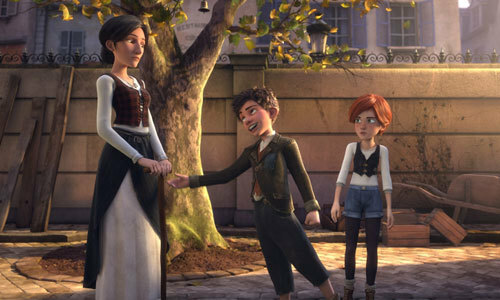 M. Luteau becomes concern when he realizes that Félicie has “lost her spirit” and encourages her to chase her dreams. Félicie has a small music box, which was the only item with her when she was found outside of an orphanage. Cruel Camille breaks the box once, and even after it is repaired, tries to break it again. Félicie believes that dance connects her to her unknown mother; this is why she dances. Félicie has frequent dreams about her mother’s voice; each time, she appears to wake up in a panic. When the ballet master learns that Félicie had lied to get an audition, and that she is really an orphan, he still gives her a fair chance to earn a spot in the ballet. Félicie has a true and loyal friend in Victor. The staff of the orphanage also appear to genuinely care for her. Félicie is encouraged to never give up on her dreams. Félicie is quickly separated from Victor when they arrive in France, and is truly on her own. She is mistaken for a thief by one adult, treated very poorly by others, and ultimately sent back to the orphanage. Camille’s mother is not satisfied merely with Camille winning the audition over Félicie; she desires even more revenge. She has Félicie sent back to her orphanage, and promises Odette, to whom Félicie had bonded, “You’ll never see her again.” This could be particularly difficult for kids who fear being sent away from their adoptive homes. Later, when Félicie returns to Pairs, Camille’s mother tries to murder her with a sledgehammer, and then again by throwing her off a high statue. 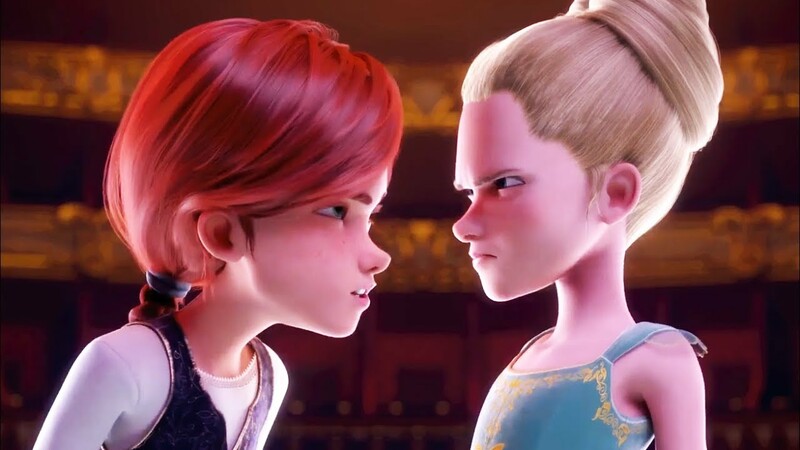 When Félicie gets frustrated at Odette’s advice, she tells her in anger, “You’re not my mom.” This hurts Odette. Félicie quickly apologizes, but Odette appears to agree. Later, Félicie comes back to Odette and proclaims that she wants to stay with he and Odette welcomes her with an embrace. Leap is an imaginative film that appears most likely to appeal to a younger audience, of maybe ages 7-10. For most youngsters, the film will be moderately enjoyable. For children touched by adoption, the film poses some potential, and some significant concerns. Félicie and Victor are orphans, and Félicie eventually does find a sense of home with Odette. 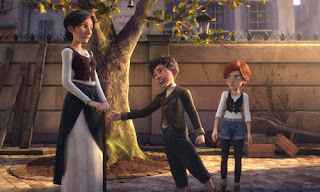 Parents viewing the film with their children could point out all the people that care for Félicie, and could also highlight the fact that Félicie didn’t give up on her dreams, and the fact that one of her dreams continues to connect her to her birthmother even though she has no knowledge of her. Conversely, there are some significant challenges: Félicie is sent back to the orphanage by a cruel woman. People speak unkindly to her. She is all alone in a big city. A cruel woman tries to kill her. A cruel child damages her only heirloom and continually tells her that she is “nothing.” For many adoptive families, the potential for good will be outweighed by the potential triggers. Parents should probably watch this one first, before sharing it with their kids. If you do share it, it does offer some positive topics for discussion. Why was dance so important to Félicie? What things connect you to your birth family? What are your passions? Where do you get them from? Why was Camille’s mother so mean? Why did Camille change? In what ways was Victor a good friend to Félicie? Why did he hide under the desk?